Traditionally, deer hunting blinds are used to spot and hunt deer in the wild, hidden among the trees of wooden areas where deer tend to feed and drink. However, most of these have been commercial products erected in specific deer hunting grounds that are highly commercialized and often part of a deer farm or preserve, where hunters pay to use the land, stay in a cabin or lodge, and make use of blinds on the property. Of course, some people have long found that they can catch deer practically in their own backyards, hunting in woods near their homes. The problem has arisen with the inability to hide adequately and keep from spooking the deer by making noise or leaving scents down on the ground. However, there are ways to avoid both situations with prefabricated deer hunting blinds. No longer do you have to struggle to build your own blind or pay to use one elsewhere. Instead, you can use a prefabricated construction set and build your own. These units simplify the angles and tower construction so that you can build a rock solid blind on your own, and best of all, they are often easily disassembled and reassembled so that you can transport them to other exciting locations for use. Look for steel brackets on your prefabricated blinds to assure their sturdiness upon construction, and look for units that offer custom sleeves into which leg posts and framing can easily slide for safety, security, and ease of assembly. Ultimately, you should be sure that whatever deer hunting blinds you are looking at come with detailed assembly and disassembly instructions so that there are no questions and the safety of the unit is not compromised by guesswork. Also, don’t settle for an expensive setup when you can find something of the same quality for less money. There are plenty of inexpensive units available so that you don’t have to waste time and money. Keep in mind also that deer hunting blinds should assess the basic needs of a hunter and do not need to be luxurious or any particular beautiful color. Green and brown blend in with the woods, camouflaging the unit for deer, and your interior comfort is of no concern to wild animals. If you’ve ever been involved in hunting deer and sat in a blind for hours on end, you’ll realize that the important elements are visibility your ability to see the deer from all sides and their inability to see you and sturdiness. 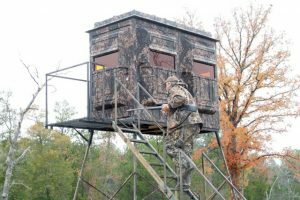 Since these elements can easily be accomplished with a small amount of money by opting for one of many prefabricated deer hunting blinds, there is no reason to spend a lot of extra time on building your own or extra money either renting one from someone else or buying one with a lot of fluff.